Nothing is more important in a high-back mesh chair than personal comfort. 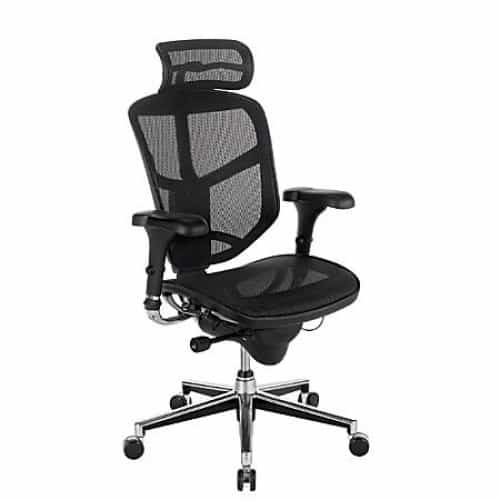 Every adjustable feature on this Quantum WorkPro ergonomic mesh high-back chair is designed to better your sitting and working experience, so you can enjoy a highly customized resting spot. Black Quantum WorkPro high-back mesh office chair features elastic mesh fabric that breathes to keep you cool. Unique elastic mesh fabric adds a contemporary look to your workspace while providing a breathable seating surface. Overall dimensions: 51 3/4"H x 29 1/2"W x 28"D.
Height-adjustable armrests help relieve shoulder strain. Reduce undue stress on your neck and shoulders thanks to the comfortable armrests. Adjust higher or lower to best fit your body and posture. Seat glide mechanism lets you find the right fit. Seat cushion glides forward or backward to best accommodate the length of your legs so you're supported while working. Tilt controls for optimal positioning. Change your chair's positioning with the touch of a finger! Synchro tilt reclines the backrest increasing the angle between your torso and thighs for a comfortable, ergonomic sitting position. Once you find your best position, use the tilt lock function to stay in place. Pneumatic 1-touch seat-height adjustment for proper posture. You can raise or lower your seat with hardly any effort using the pneumatic seat-height adjustment. Sit with your feet resting flat on the floor for correct ergonomic positioning. You can even adjust the height of the head rest for even more customized comfort. Adjustable lumbar cushioning helps support your lower back. By adjusting the height of the back cushion you can easily adjust the lumbar support which enhances the natural curve of your spine. Black nylon frame construction ensures durability. High-back mesh office chairs blend cool comfort with plenty of back support to help you feel energized throughout the day. Greener choice — contains a minimum of 40% total recycled content. I love, love, LOVE this chair! It's stylish, it's ergonomic, it's adjustable, and it's perfect for me! THANK YOU BEVERLY HILLS CHAIRS! The durable aluminum frame on this ErgoHuman high-back mesh chair has a modern chrome finish that gi..